"Quality, Reliability, Performance and Ease of Communications"
Whether it is 53’ air ride dry vans or flatbeds, the care and concentration upon your load cannot be matched. 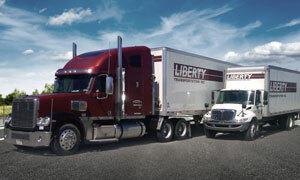 Customers quickly discover a unique level of service offered by the Liberty Full Truckload Team. From one stop to multiple stops, our specialty, your loads will arrive safe and on time. The awards, the customer service ratings are remarkable. Service levels are leading at a customer location with 60 delivery teams or a 5-unit satellite remote hub location. The customers tell “The Liberty Story” on a daily basis. Send your product direct from your manufacturing facility, supplier facility or from the port to us. 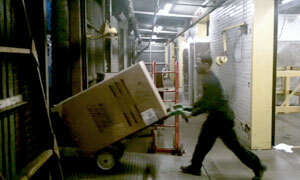 Our cross-dock warehouses keep our clients’ products moving continuously, even in the most difficult situations. Let us unload, reroute, restack, shrink wrap, palletize and redeliver your product, from last mile furniture and appliances, to small freight delivery, we’ll treat it with care and send it on its way. Our warehouses are all connected; you will still have one contact point to call for the assistance of all services. Imagine a Liberty customer working with us for 20 years, over 100 powered units dedicated and another Liberty customer, dedicated transportation, starting 6 years ago with 5 units and today has over 100 units. We are honored with the faith our customers have placed in us and we could not be more honored with awards for customer satisfaction bestowed upon Liberty. Well documented evidence in achieving positive results at an excellent value. Several times each day, we find personal and corporate rewards in our success rates upon safety, security, very low associate turnover and gratifying client and customer testimonials. From the largest employer in the small village of New Alexandria, PA, we have only two words to say . . .